I discovered The Aromatree Company in a magazine and they specialise in natural foot care. The company was founded and created in 2010 by Kirsten Luff, a qualified Holistic Therapist. "Kirsten decided to develop a range of natural foot care creams which worked therapeutically and systemically with the body and used the power of 100% pure essential oils so she could utilise these within her Reflexology treatments and so adding another dimension to her treatments." The range of creams available not only nourish your feet but the blend of essential oils may help with your emotional wellbeing. You can choose from Release, Relax, Revive, Repair, Energise, Immune Boost, Clear and a foot scrub. 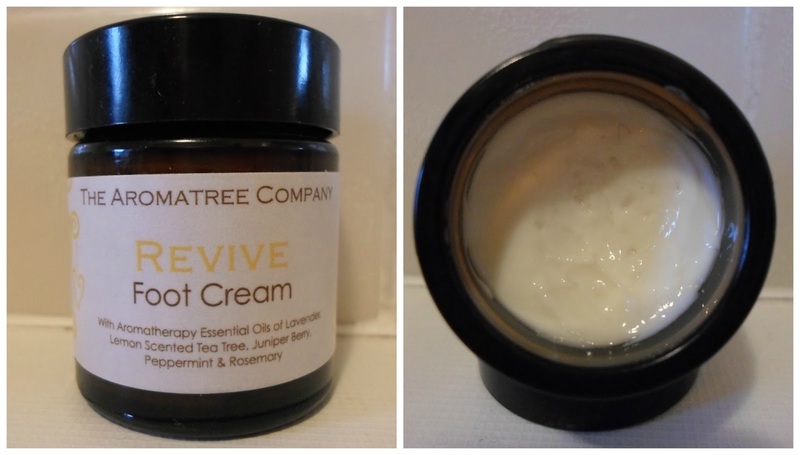 I bought the Revive cream because the blend of oils (Lavender, Lemon Scented Tea Tree, Juniper Berry, Peppermint and Rosemary) appealed to my personal taste in fragrance. "An easily absorbed moisturising foot cream to help revive tired, achey or swollen feet. When massaged into the feet can have a cleansing, tonic effect and help stimulate circulation. Not suitable for pregnancy, high blood pressure or epilepsy." I find the fragrance enjoyable and the lemon tea tree gives this cream an uplifting and fresh aroma, a nice change from traditional peppermint associated with products targeted to feet. I would describe the cream as light and certainly not a butter, for this reason I would hesitate to recommend to those with extremely dry feet. You would probably want to use this in a routine where you rotate with a heavier buttery foot cream. I do find this sinks into my skin with ease so no slipping and sliding across the bathroom floor or wearing socks to bed. My feet are in good shape at the moment as I had a couple of pedicures last summer but I still have dry patches on my heels. The Revive cream will improve dry areas as long as I maintain application on a daily basis. I rarely experience tired, achey and swollen feet but from my limited knowledge of aromatherapy, I can see that the oils should target these issues. I only have one minor criticism to mention and that is ingredients are not listed on the website. To give you a quick overview, here are some of the ingredients (not the complete list & in English rather than INCI) as per my jar - water, olive oil, sweet almond oil, shea butter vitamin E, cocoa butter, essential oils of lavender, lemon tea tree, juniper berry, peppermint, rosemary and the preservatives are phenozyethonal & ethylhezglycerin. It is suggestsed that this cream can be applied to hands. I have not specifically used it for this purpose but on the basis of having to apply to feet, I notice it's ideal for anyone who hates greasy creams. I have the 30ml jar which costs £4.95 and there is a larger size available (120ml/£18). If you enjoy foot care and aromatherapy this company is well worth looking at. Let me know your thoughts? Has my review tempted you to try for yourself? Do you like pampering your feet or do you neglect them?